If you want to see or do anything interesting in Japan, avoiding crowds isn’t easy. But far from the urban sprawl, there’s a peninsula in eastern Kyushu where you can enjoy some peace and quiet while having plenty to do. 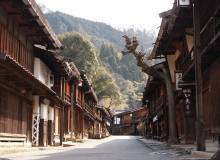 In a prefecture known for its fine onsen, hidden discoveries lie waiting throughout Kunisaki, a place known affectionately as Rokugo Manzan (which refers to the six villages and various shrines and temples of the region). Japan is renowned for its cuisine, but have you ever had a home-cooked Japanese meal straight from the farmer’s field? In Oita, you can visit one of many family farms, work with your hands in the field, sit down to dinner in a rural home and even spend the night there. I had the opportunity to visit Ume no Sankeien, the home of the Tanabes. From the house, Mrs. Tanabe took me along with two buckets and some clippers on a short walk down a stretch of river to her fields. 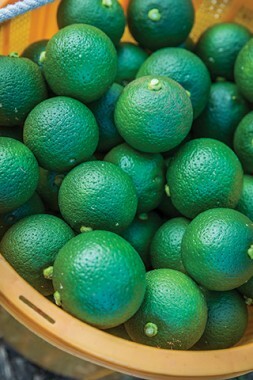 On this day in late summer we harvested one of Oita’s most renown agricultural exports, kabosu, a kind of citrus fruit. The afternoon sun glowed on the rice fields and forested hills and the sounds of nature surrounded us. I saw herons and egrets along with colorful dragonflies, cool beetles, and even crabs scurrying through a bamboo grove. Among the kabosu trees, the smell of fresh citrus entered my head and my thoughts drifted merrily as I snip-snip-snipped to the rhythms around me. We filled the buckets in no time. Back at the house, Mr. Tanabe joined us for the hearty meal and the glasses of beer never went empty while the stories flowed. Myriad folk have stayed with them over the years, from urban high school troops to diverse international travelers. The Tanabes couldn’t muster more than a couple of words in English, but with a can-do attitude and time that the rural life affords, they always find ways to get to know their visitors and make memories. Starting off with smiles and a hearty welcome, working cooperatively, and sharing meals can bring anyone together. 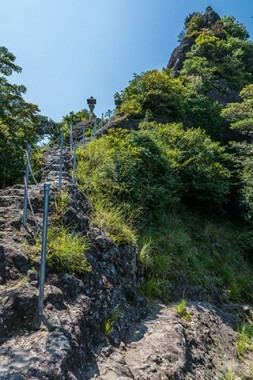 The peninsula works as a microcosm for all of rural Japan, yet has its own uniqueness with a series of attractions strung together in a Long Trail. From ancient times, the devout would walk these pathways for ascetic training that combined physical exertion with natural beauty and religious pilgrimage. Today, you can follow in their footsteps for all 135 km or drive to individual features of your choosing. 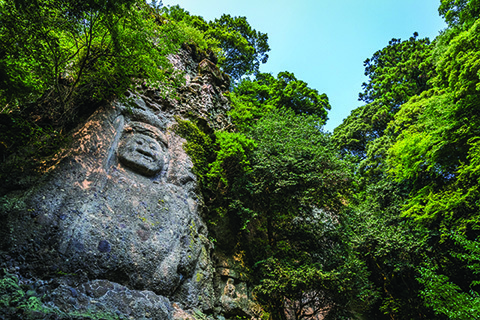 In the mountains, the mossy forest trails lead you to extraordinary shrines and temples. 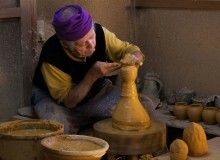 Some are carved out of volcanic rock on the craggy peaks of green mountains. 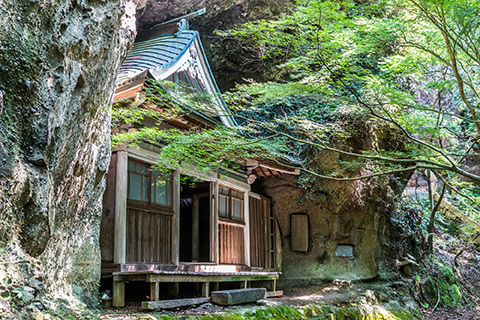 A lofty cave shrine gives an alternative scenic view of surrounding peaks. You’ll also find ancient cliff carvings facing the elements after some 900 years. Many locations are beautifully surrounded by Japanese maples that make it magical in autumn, and you’ll even find the oldest wooden structure in Kyushu here. And on the edge of the wooded foothills of the area’s highest peak stands the area’s grandest temple complex, Futago-ji. In-between the places of pilgrimage, the trail offers views of the Inland Sea National Park as well as lush forests with Sawtooth Oaks, the perfect vehicle for growing shiitake mushrooms. In fact, these, along with numerous irrigation ponds, picturesque pockets of terraced rice fields, and craggy mountains, all make up an ecosystem special enough to be designated a Globally Important Agricultural Heritage System by the UN. It wouldn’t be Japan if all this hiking didn’t lead to a good meal. 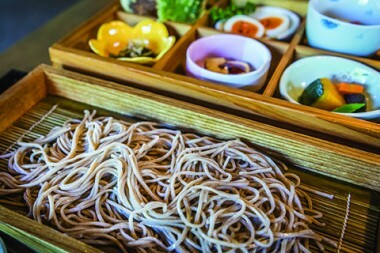 One of the area’s specialties is soba (buckwheat noodles). Near Futago-ji, Futago Kawaraza takes soba to a new level, preparing theirs fresh from the mountain spring water of Mt. 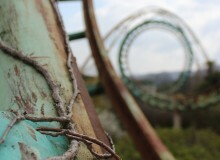 Futago. They pair it with a large variety of meticulously arranged seasonal side dishes and serve it in a relaxingly spacious wooden interior for an all-in gourmet experience. Try some with a squirt of fresh, tangy kabosu. If you’re looking for a timely reason to visit Kunisaki, 2017 is a major anniversary year. Exactly thirteen centuries ago, a priest named Ninmon established most of the sanctuaries throughout the six districts. In celebration, events from September through December light up the peninsula’s temples and shrines with festivity as the leaves change into a brilliant autumn landscape. After taking in the natural beauty, experiencing the festivals, and living the rural life, a genuine Oita onsen is the perfect way to wrap up a day. Soak in the healing waters, close your eyes, breathe the fresh country air, and let the new memories dance in your head.